Home » For Braces » Dental Wax and Dental Silicone for Braces » Tooth Colored Wax - Bulk Box of 25 - NEW! Tooth-Colored Pontic Wax - Bulk Box of 25 - NEW! Tooth-colored dental wax is great for those times when you want to hide or obscure your braces or if you need to fill in a space for a missing tooth in your Invisalign. Soft and pliable, it is slightly more opaque with yellow undertones than regular dental wax to match the natural color of most teeth. While it won't completely hide your braces, it will make them a lot less noticeable Some dentists call this type of wax "pontic wax" and use it to fill spaces in clear retainers where teeth are missing. This wax is unscented and unflavored. There are 25 containers of tooth-colored dental wax per bulk box. Please note that dental wax is not returnable due to health regulations. 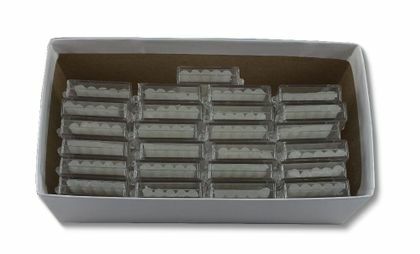 Each box contains 50 containers of tooth-colored dental wax. Wondering if this dental wax comes in a few different shades or just the one shown? The wax comes only in one shade, as shown.